At Team Dental Swedesboro, we offer our patients the latest proven technologies in cosmetic dentistry including Cerec restoration services. Cerec is a superior method of creating precisely-designed, color-matched and highly durable ceramic crowns. Cerec crown restoration is offered as a same-day service right in our practice. 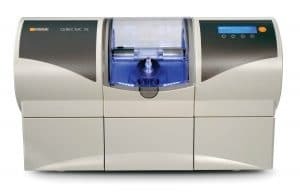 Cerec technology is a state-of-the-art Computer Aided Design (CAD) software program which uses a digital 3D camera to create an optical impression of the area of the mouth to be restored. Watch as your new, highly aesthetic, metal-free dental crown restoration is designed and then milled within a few minutes. No temporary crown, no second visit. This eliminates lost time away from family, home, and work!